Bill King: You point to one album as being pivotal to your introduction to jazz. 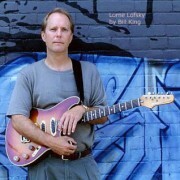 Lorne Lofsky: The Kind of Blue album. It’s one of those things that are hard to put into words. There was something about the music that touched something in me that I’d never experienced before? There was a certain mood I experienced. The fact that it was very understated. I wouldn’t call the playing hard flat-out playing compared to the Coltrane quartet when they were wailing or Miles band later on. There was this cool understatement that was happening and a sense of mystery I got from listening to it. It was something I had never heard before and there was this little light go on in my head that said wow! What is this? I guess I was ready for it. Many years before I had a friend who played trumpet – I played bad third trumpet in junior high – put on My Funny Valentine album. For what I heard I wasn’t ready to understand what was happening. There wasn’t anything that pulled me in. Not like when I’d turn off the lights and listened to Kind of Blue and try to pick up things subliminally. I was still playing rock & roll and blues at the time and feeling rather limited. I knew my three or four B.B. King and Eric Clapton licks and just kept playing them over and over mindlessly. Bill: Did you isolate and listen to the flow of certain instruments? Lorne: I paid a lot of attention to Bill Evan’s solo on “So What?’ It was almost like watching a movie in another language without sub titles. Bill: Did you search around for private instruction? Lorne: I did take a few guitar lessons with someone named Tony Braden in the early seventies. We didn’t talk about music per se or improvising. He tried to show me the mechanics of the guitar – some scales and things. I started hanging out with friends of mine who were getting into jazz and listening a lot. We’d go out to places like George’s Spaghetti House. I used to go and listen to r Ed Bickert and Lenny Breau play. Sonny Greenwich. Ted Moses when he was in town. I was just absolutely amazed these players knew what to do and when to do it. I had no idea about listening and reacting and having a certain amount of skills to naturally react. Bill: Did university studies with John Gittins answer some questions for you? Lorne: To a certain degree. I was at York in the early to mid seventies as a part time student one year and took some theory. At the time I wasn’t ready for that kind of thinking. I found it to complicated and didn’t really understand it. The next year I went to a jazz workshop and in my free time played constantly. If I wasn’t playing I was listening at home or in a club or jamming. I really didn’t go the music school route. The main thing I got from university was the importance of playing with a strong time feel. The two people I learned the most from were John Gittins and Bob Witmer. Another thing that caught me at the time was that album with Paul Desmond “Pure Desmond” that took me to another universe. I was hearing a guitar that sounded like an orchestra and I had no idea what was going on. I get kind of compulsive about things and go for it. I would spend untold hours lifting Ed Bickert’s solos. I asked Ed years before in this long defunct club called Meat & Potatoes if he taught and I said he didn’t and recommended Tony Braden. Bill: How about the live playing at the time. Lorne: Ted Moses opened the Mother Necessity Jazz Workshop around Queen and Victoria and I did some playing. A couple years later I started doing jobbing gigs – weddings and casuals to make some money and club dates playing wallpaper music. The late great Jerry Toth heard me – this I won’t forget – I met him at Mt. Pleasant and Eglington and we were chatting about one thing or the other and he asked if I’d like to work with him at George’ Spaghetti House. I think he was the first to hire me at George’s. I was on cloud nine. It was the greatest thing in the world. After that I slowly broke into playing some of these places. Bill: Did that opened the door to backing touring international artists. Lorne: I was fortunate. George’s was going strong and Paul Grosney was booking Bourbon Street and I guess he took some sort of shine for me for a while and started booking me there. I got to play with a lot of great people there – Chet Baker, Carl Fontana, Groove Holmes, Jimmy McGriff, Phil Wilson, Georgy Auld. It was great for me as far as I was concerned. I was getting paid to learn. I always asked questions. I’d ask if what I was playing behind them was O.K. or if I was getting in the way or did they want me to learn other tunes. I did one gig with Bob Brookmeyer who had these great arrangements that was incredibly educational. Bill: Is this where Oscar heard you play? Lorne: No, that was at George’s Spaghetti House. I was there with Butch Watanabe a mainstay of the Toronto scene. Oscar came in to hear the group and I met him briefly. A month or two later he telephoned me about doing a recording. I thought to myself, why me? I was blown away by it. When it was time to record it was a huge deal for me. I’d never recorded on my own before. I went on to do some playing with him in the early eighties in Edmonton and he featured me at the Forum at Ontario Place that doesn’t exist no more. It’s funny how things work. A few years before I remember going to hear Oscar with Jerry Fuller on drums, Neils Pederson bass and Joe Pass on guitar and sitting up on that hill overlooking the Forum and listening to the band and thinking to myself that one day it would be unbelievable to be down there doing something like this – not necessarily with him or whoever. Several years later I wind up playing in Oscar’s quartet for three years and the same thing happened with Ed. In 1983 Larry Kramer and Jane Bunnett had this series at a place called Harpers on Lombard Street. One day Larry telephoned me and asked if I’d like to play in a quartet with Ed Bickert. My hero! I said, “Are you kidding – does he want to play with me, that’s the question?” Needless to say I was quite nervous the first gig. It was fun and he was totally accommodating. Bill: Did it take long to find a comfort zone with Oscar? Lorne: The first gig was at the forum and he actually let me do some trio tunes. What he did in the situation was first play a few trio tunes and then he brought me out as a featured performer with Terry Clarke and John Heard. There I was before this huge crowd. All I remember was it was exhilarating and terrifying at the same time. Dizzy Gillespie played somewhere earlier that evening and I’m in the middle of a solo with my eyes shut and I hear this wild applause. First of all I know it’s not for me and second I know what I’m playing isn’t that good and then I hear this trumpet chime in on the tune. It was an incredible experience. I was out in Edmonton with Oscar and Dave Young and we started playing some of Oscar’s original tunes I’d had never heard before. I’ve always had pretty good ears and pick up things quickly. The first night he started playing on “ Sweet Georgia Brown” and he was ripping it up – definitely in his prime. There were flames coming off the piano and as he’s winding down to the last couple of bars he gets down lower and lower on this Bosendorfer piano with the extra bass notes I call those thunder storm notes cause when you’re down so low it’s not the pitch you hear but a storm system moving in off the lake. Anyway, I’m just sitting there figuring he’s going to do more and he just turns to me after hitting this low F and says you got it. So right away I had to do something so I started playing “ Sweet Georgia Brown” by myself. He got me! Every night after that I knew the routine. I’m really thankful about going through the trenches. It’s a great way to learn. Looking back it’s made me stronger player. You don’t get this in music school. Bill: At present you teach a lot. By choice or evolution? Lorne: I’ve been married several years and have a son and need a certain amount of stability. I can’t just pick up and run off. I guess if I were a little bit younger and still single I would probably be pursing more traveling gigs and more. The best way for me to take care of business being a musician is teach. I’ve been doing it for years. I do a fair amount at home. I’m now concentrating on just teaching at York University. They’ve instituted private instrument instruction. I can be more selective teaching. I don’t have to take every gig I get called for and realize time is more valuable. Bill: Two videos: Approaches to Jazz Vol. One and a second New Standards. Lorne: A few years ago I chatted with somebody by the name Bill Piburn who lives in the Nashville area and hooked up. A friend told he was getting into doing these video things. He did one for Jack Wilkins and a few others. We talked and I found he had a great heart and really supported the projects he was involved in so he arranged for me to fly down to Nashville during a Chet Atkins tribute – three or four years ago. I performed a short set. While there I went into a little studio with a good local bass player, Jim Ferguson and did it all in one day. Jim and I did the performance video first which was good since it allowed us to relax in front of the cameras. It’s not the most comfortable situation. You’re there in this little room with a white backdrop to absorb the glare with four or five cameras trained on you. You’re supposed to be relaxed, articulate and trying to be creative. I have to say most the playing considering the circumstances is quite good. We might make a CD version of the performance video. We had about an hour break. Then I played for an hour without a break. I had these sub titles jotted down on a piece of paper on the floor so when I got to the end of whatever topic I was talking about we wouldn’t need to edit anything. I went as long as I could. I was on a bit of a roll and went and hour or hour and fifteen and talked about things that are important to me – fundamental things. Things that are practical that I use when I play and a lot of musicians use when they play. The instructional thing comes with a little booklet. They seem to be doing well. I have people e-mail me saying that they’ve purchased it. Bill: You have a fairly sophisticated website. Does it do the job? Lorne: There’s a good story behind that. There’s this guy Greg Blake I guess you’d say is a hobbyist guitar player who has some incredible computer Internet skills. We were talking and he suggested I have a web site. I really didn’t have the money to do something sophisticated and didn’t want to do something that looked cheesy. He volunteered to do it for me. I said, “You’ve got to be kidding?” Slowly but surely he began working on it and another dear friend Brian Behie teamed with Greg and they worked together. Greg did a lot of the technical work and Brian had some fabulous ideas. Greg is so skilled he’s in great demand from companies. I enlisted the help of Lucy Frigault. I prepared an ad hoc lesson on diminished harmony and emailed them as attachments to her and she did incredible things in making them navigatible. She posted it and made it available in such a way that it’s very user friendly. She also helped polish the look of the site and help me set it up to do business. She’s a great lady and did such a wonderful job. The lesson is there for purchase.